PHILADELPHIA, PA – December 11, 2017– Janney Montgomery Scott LLC (“Janney”), a leading full-service wealth management, financial services, and investment banking firm headquartered in Philadelphia, PA, announced the hiring of R. Gene Gaillard and Stephen J. Zales. 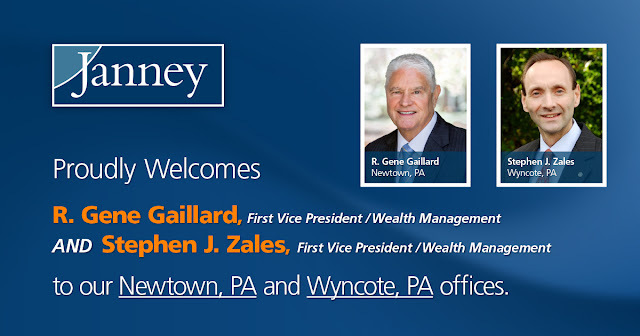 Gaillard has joined the Newtown, PA office. Zales has joined the Wyncote, PA office. Gaillard, First Vice President/Wealth Management, was previously affiliated with Wells Fargo Advisors. Gaillard is a graduate of the University of South Carolina, attended New York University, and has been active in the Montgomery Township Economic Development Committee and Rotary Club. Zales, First Vice President/Wealth Management, was previously affiliated with Wells Fargo Advisors. He graduated with honors from Syracuse University with a Bachelor’s Degree in Economics and has been working in the investment industry since 1991. Janney’s Newtown, PA branch office is located at 1020 Stony Hill Road, Suite 150, Yardley, PA 19067.